We all have those days that we just aren’t quite all there. You know those days, you don’t really feel like doing anything, but you know you need to get things done. What can you do to get refocused, re-energized and back in the game? 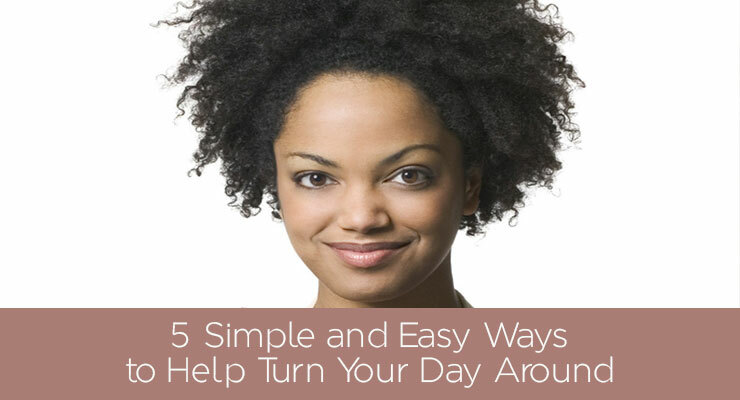 Luckily I have gathered a few of our best ideas and go to methods to help you in getting back to your day and ready to take on the world. That’s right, use your body and get the blood pumping. You don’t have to run a mile or even leave the house. Something as simple as turning on your favorite music and dancing for a song or an entire play list can really help adjust your mood. Have kids at home? Get them moving with you. I have yet to come across a young child that doesn’t enjoy a spontaneous dance party. If you aren’t the dancing type, go for a walk. It is not written anywhere that going for a walk has to be 30 minute or longer. 5-10 minutes moving about can sometimes be just what you need to tackle the day. I find that on days that I am not quite feeling right, it shows in my appearance. Try a facial scrub or mask. If you don’t have any in the house, look in your cupboards. My friend, who is an esthetician, swears by a raw honey mask. Simple place honey on the skin and 20 minutes later your skin will feel softer and look simply glowing. If you don’t want to mess with lotions and potions, put on something bright and unexpected from your wardrobe. I have a large crystal necklace, that is classified more as evening jewelry than daytime, which I rock regularly during the day. It makes me feel a little bit glamorous and helps put me back in the mindset to take on the day. We have all heard the saying ‘Laughter is the best medicine’ and who hasn’t felt a little better after a good laugh? When I need a good laugh I call on some of my best friends who always have a good story or two up their sleeves that can leave me laughing so hard I have tears in my eyes. If your friends are not the stand up comedian type you can always find a good clip on the Internet that will make you crack a smile. My favorite go to when I am in need of a laugh and no one is available, is reading a quick chapter from Jenny Lawson’s book “Let’s Pretend This Never Happened”. While her humor is not for all, she makes me laugh out loud every time I read it! If you have 10 minutes, get outside and smell the fresh air and take a moment to see what you have around you. Better yet, take your camera, phone or whatever device you have and take some pictures of unexpected beauty. You will be surprised at what you find. This one is not along the lines of buying those gorgeous Brian Atwood heels you have been eyeing, but more like purchasing a book you having been wanting to read. If you have been cutting back and not heading to the nearest coffee shop for your daily cup of Joe, splurge and get that Pumpkin Spice Latte you have been craving. Sometimes it is the little things that truly make you feel better. Plus you won’t have any major retail regret later! One of my favorite ways to get back on track after a rough day is to sit down with some good friends and enjoy their company. If there is a glass of champagne involved, even better, but there is definitely something special about having some girl time. It can turn around even the darkest day. I love these tips! I think it is so important to move your body every day as it is a great way to relieve stress. Even better if you can get outside as it would be a two in one sort of deal (moving your body and getting outside). I also like the ‘outside in’ part, I tend to feel 100x better when I put lipstick on. Silly I know!